Elation over a historic deal to clean the sprawling Santa Susana Field Laboratory earlier this month garnered significant media coverage for good reason: The California Environmental Protection Agency division overseeing cleanup of the long-closed Rocketdyne rocket-testing and nuclear-research site convinced two federal agencies to agree on a plan for ridding the polluted acreage of toxins. Cal-EPA’s Department of Toxic Substances Control (DTSC) persuaded the Department of Energy and NASA to clean up their polluted portions of the 2,850-acre site, leaving behind only normal, or background, levels of radiation, heavy metals, dioxins and other chemicals. Built among rocky bowls and stunning canyons between Simi Valley and the San Fernando Valley, the testing site suffered a partial nuclear meltdown in July 1959 that was the worst in U.S. history, releasing far more radiation than the better-known Three Mile Island disaster in 1979. But lost in the glow of good news, L.A. Weekly has learned, is the fact that the cleanup will stop at the property line. In a July 22 letter, California’s toxic-substances control department had already quietly approved KB Home’s cleanup plans for an adjacent property in pretty, but toxin-tainted, Runkle Canyon. KB Home plans to erect 461 condos and homes. The department is not requiring that the tainted soils be returned to normal in Runkle Canyon. In fact, its plan appears to be to back off. Yet according to an October 25, 1999, report by Foster Wheeler Environmental Company of Costa Mesa, the soil contains radioactive Strontium-90 readings averaging nearly 27 times normal levels. The state also will stop testing surface water in Runkle Canyon for heavy metals, according to the July 22 letter, although the state’s own data, supplied to the Weekly, shows that it detected metals including nickel and barium in the single water sample it tested. Activists living in nearby Simi Valley enclaves, some of whom got involved years ago after family members fell ill, previously sought their own studies of Runkle Canyon, which found high levels of arsenic, nickel, vanadium, barium, cadmium, lead and chromium. The first study, in May 2007, was commissioned by the group Radiation Rangers. Another sampling two months later in the same area, conducted by the City of Simi Valley, yielded high levels of heavy metals. Read September 23, 2010 EnviroReporter.com post “Sleight of Land” for further information, interviews, photos, documents, lab results, videos, and a Runkle Canyon timeline. One Radiation Rangers member, Patty Coryell, calls herself “meltdown mad” over the fact that California’s toxics department is taking credit for hammering out the recent federal agreements while ignoring problems that remain at Runkle Canyon. Excitement had greeted the news that Cal-EPA Secretary Linda Adams and California Sen. Barbara Boxer had finessed the deal with Energy Secretary Steven Chu to clean up the federally controlled areas of Rocketdyne. Chu, who shared the 1997 Nobel Prize in physics, proposed an approach that bypasses lengthy and expensive risk assessments. “I’d say since March, things really shifted gears and especially with the federal agencies, the DOE in particular, I think took a huge turn,” Brausch told the Weekly on September 3, the day the draft agreement was announced. “We basically said, ‘OK, let’s clean up to background [levels] and now focus on that as being a performance standard.’ If you find it above background, you take it out. There really isn’t this question of how much and how clean and that sort of thing. We’re bypassing all of that,” Brausch said. Yet until a Weekly reporter told him, Hirsch was unaware that California’s toxics department had approved a “response plan” for KB Home on July 22 that didn’t require the soils to be returned to normal radiation and toxin levels. The response plan the state sent to KB Home, which is posted on the department’s Runkle Canyon website, is the culmination of an April 2008 agreement between the department and developer to clean up contamination in the canyon before home building begins. 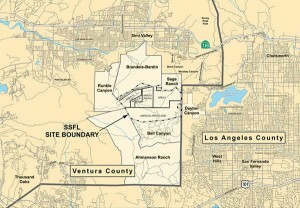 Westwood-based KB Home hopes to develop 1,595 acres west of the lab site. 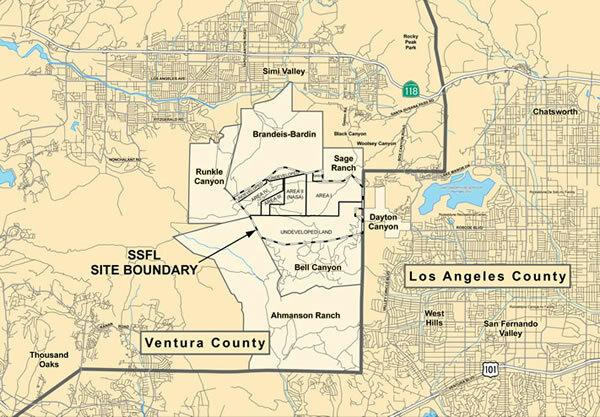 In 2005, the Ventura County Reporter revealed that radioactive Strontium-90, which can cause leukemia, was found at hundreds of times normal background levels in the soil. Since then, the proposed KB Home development has been embroiled in controversy. This writer authored the Reporter story, “Which Way the Wind Blows,” on March 17, 2005, which revealed that the subdivision’s construction would launch more than 100 tons of dust into the air — not far from scores of Simi Valley and San Fernando Valley homes. The finding was based upon the developer’s daily dust estimates from its Environmental Impact Report. Hirsch, who was responsible for unearthing many of Rocketdyne’s decades of practices that left behind toxins, recommended DTSC require that 141 different Strontium-90 samples be tested from Runkle Canyon. But the department is requiring KB Home to test only 36, or one soil sample for every 44 acres. The fight intensified in late 2006, when the Radiation Rangers began pressuring Simi Valley city officials to take another look at the picturesque property. The city had approved its development in 2004 on the basis of an Environmental Impact Report that Hirsch and the Rangers say deliberately obscured radiation readings and contained no chemical-content data on Runkle Canyon Creek — which later turned out to be contaminated with heavy metals. The Rangers’ test results showed the creek’s arsenic readings were 15 times the “maximum contaminant level” for drinking water, more than 21,000 times the EPA’s “preliminary remediation goal” and 37,500 times the agency’s “public health goal” for potable water. A mud sample was laced with arsenic, and was 548 times the EPA’s preliminary remediation goal and 213 percent more than DTSC’s arsenic “field action level” — an amount that warrants further investigation. Yet no further investigation of Runkle Canyon’s heavy metals is anticipated under California EPA’s current plan, even though that’s where people will live and hike, able to amble someday to Rocketdyne’s famed, long-shuttered site itself. It is now up to KB Home to complete a “response plan” detailing how far it is willing to go in cleaning up the canyon. Brausch says the toxic-substances control department still has wiggle room to make final decisions about the overall condition of the subdivision site.